Why does it matter where you bank? When you deposit money into your bank account it does not remain there idly. Your deposits help banks fund new loans, which they offer to a whole range of projects and companies. Your money may be helping banks finance projects which are unethical, unsustainable and environmentally damaging. Switching banks means you can move your money away from such projects, and invest in more ethical business that aligns with your principles - a personal divestment. The logic is both symbolic (as it inflicts bad publicity on the banks) and practical (it moves real capital out of banks). You can make a meaningful impact by choosing a bank more in line with your personal values - an important consumer choice in the same league as going vegan, or buying organic. What are popular banks doing wrong? We’ve rounded up some of the most popular high street banks and put together an outline* of their investments and policies, so that you can get a sense of what your bank might be implicated in. For more information on why these activities are damaging to communities and the environment, see our explanations. If you want to find out more we have used BankTrack for much of our information, and there’s also lots available on Campaign Against Climate Change. 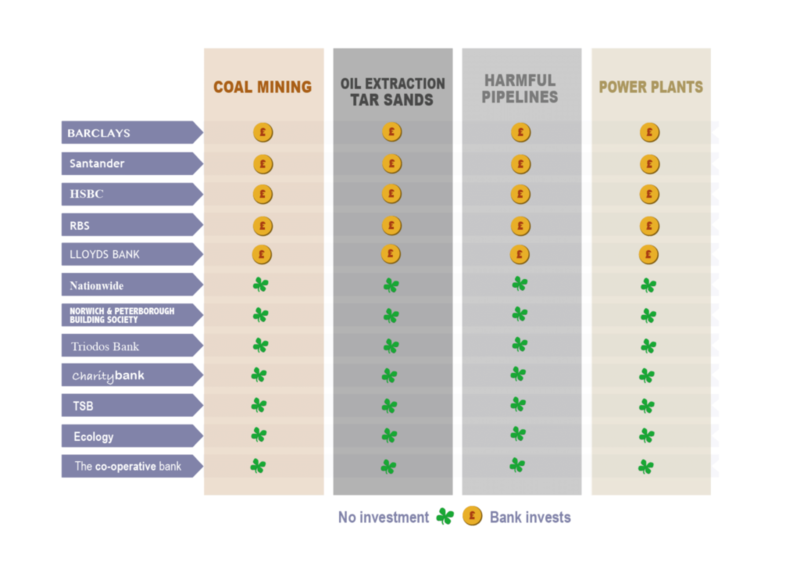 The Rainforest Action Network’s ‘Banking on Climate Change‘ page compares banks in terms of fossil fuel investment. You can make up your own mind about the activities we’ve summarised below – we’ve highlighted some of the more ethical banking choices below! See the end of this webpage for references. Who can you switch to? The good news is there are some banks which are not actively causing harm and a few who fund some great activities. Most building societies tend to have a local and community focus which de facto excludes them from providing funding to fossil fuels and other harmful projects. 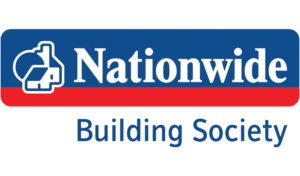 We have only compiled a profile for one building society, however there are others out there which you might be interested, in such as Cumberland Building Society among many others. Cooperative, Ecology and Triodos have all signed the BankTrack’s Paris Pledge to not invest in coal related activities. We have also compiled a profile of some ‘challenger’ banks. These are relatively young, so we are yet to see where exactly they stand with their ethics however offer an interesting alternative to the presently popular high-street banks. Please note, our website is intended only as an introductory guide, and we advise you to carry out your own research before making a decision! Switching your current account can be super simple by using the UK government maintained Current Account Switch Service or you can do it yourself. The Switch Service works by automatically moving your payments and direct debits over to your new account, which you need to open yourself. You need to ask your new bank or building society to move your old account using the Current Account Switch Service. The transaction and recipient history from your previous account won’t be transferred – so remember to export these prior to the switch if you’ll need them! We are compiling [case study] of our campaigners switching and will keep the page updated! If you are worried about the security of your deposits in a less mainstream bank, you can check with the FSCS here. Switching your savings account is much simpler. All you have to do is move your money out of your old one and into the newly-opened (ethical!) account. If you are a student with an overdraft on your account, it may be a bit more complicated – see our advice. Again, we suggest you check with your new bank before making your switch! I have been a longtime customer of yours, but I am switching banks due to your continued direct lending to fossil fuel projects. I would be delighted to return once you align your lending practices with the Paris Agreement targets. We want to measure the impact of our campaign and hear your feedback. If you have switched your bank or are considering doing so in the future, please take a minute to fill in the form below.